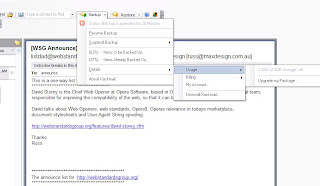 Xackmail is a real-time online email backup. It's a 1-click backup and a 1-click restore solution so there are no complex setup or selection of emails and accounts. It is special for lawyers, architects, mobile consultants, doctors and small businesses, but you need pay $2 a month for unlimited backup. I think about if it is security or safe.